By Betsy on March 5, 2014 in #HistCraftivism, activism + protest., charities + orgs., crafters + makers., craftivism., feminism + human rights. A few days late on this one, thanks to traveling, but here is week #4, about the arpilleras of Chile and the arpilleristas who made them. Added to all of this was that people couldn’t talk to each other because they didn’t know who was supplying what information to the government. 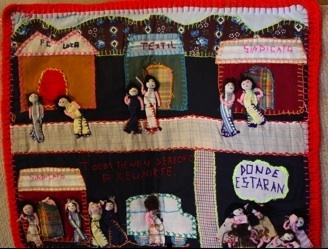 Under the safety of the church, the Archdiocese of Santiago, set up a human rights organization where women could come together and make tapestries about what was happening. Folk lore has it that Peace Corps volunteers smuggled these tapestries out of the country (often with little pockets in the back containing paper with more information) and that is how the world found out about what Pinochet was doing. Below is more information taken from various sources around the web. Clicking on the text and on the photos will take you to the initial source. 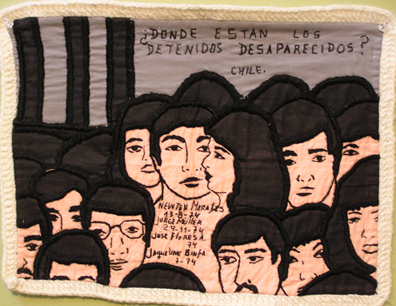 As you will see, these pieces are still being made as people remember “the disappeared” (los desaparecidos). It began with a group of mothers, almost 14 mothers. They met in morgues, hospitals, former tribunals of justice, and realized that all the elements that were such an important part of Chilean society were closed. Completely vanished. And they sought help by contacting a newly developed organization that was a branch of the Catholic Church, called the Vicariate of Solidarity. The Chilean Catholic Church took a very courageous position towards the disappearances and abuses at the hands of the Pinochet government, very different than in Argentina or Guatemala. The more I think about this story, the more I believe that it’s a story of belief – belief, magic, and storytelling. The women that suffered the most, as we know throughout the stories that we see in the media, as we know through Katrina, were the disadvantaged. The poor. Poverty is also a punishment for authoritarian governments. These women were trained in the most traditional art of femaleness in Latin America, which was to sew, to embroider. The colourful patchwork scenes make the arpilleras visually deceiving. Using a traditional form of folk art, they mix coded imagery with contemporary history. They depict the often tragic situations experienced by thousands of Chileans every day. These honest and sometimes brutal accounts provided future generations with a popular version of history, one that contradicted the official version depicting General Pinochet as the savior of Chilean democracy. The circulation of the arpilleras outside Chile brought this alternative history to the larger world. Just as they went unrecognized as revolutionaries, the arpilleristas were also unrecognized as artists. This, along with the folk art appearance of their work, initially helped them remain under the military authorities’ radar. Exporting arpilleras became illegal once they were seen as anti-Chilean, but they continued to be smuggled out of the country. Violeta Morales died in 2002, never having found her brother Newton, who disappeared in 1974. “The arpilleras were often made from clothing of the disappeared and the names of missing loved ones can be found on some pieces. Other sewn words and expressions were simple protests: Dόnde estás? Where are you? The censorship that characterized Chile under Pinochet’s dictatorship defeated written words that opposed his regime. 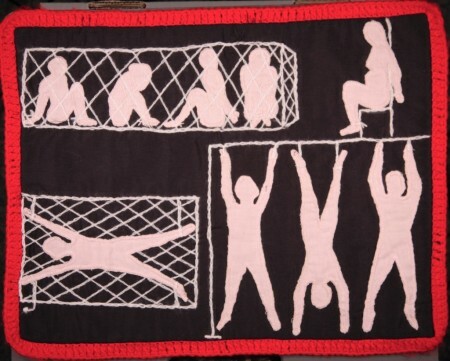 The handwork of the arpilleristas testified for the oppressed and detailed the struggle for truth and justice despite the suppression of the military government.